A project closely aligned with MAPP has been awarded Horizon 2020 funding. Intelligent data-driven pipeline for the manufacturing of certified metal parts through Direct Energy Deposition (INTEGRADDE) is led by AIMEN Centro Tecnológico. 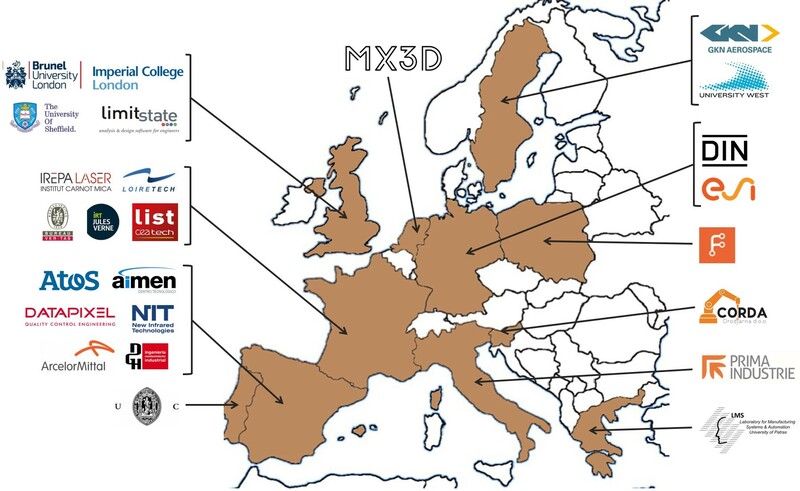 The 12.7 million Euro project has more than 20 partners from 11 countries. INTEGRADDE aims to develop an end-to-end digital manufacturing solution, enabling a cybersecured bidirectional dataflow for a seamless integration across the entire additive manufacturing (AM) chain. The goal is to develop a new manufacturing methodology capable of ensuring the manufacturability, reliability and quality of a target metal component from initial product design via Direct Energy Deposition (DED) technologies, implementing a zero-defect manufacturing approach ensuring robustness, stability and repeatability of the AM process. Development of an intelligent data-driven AM pipeline. Combination of automatic topology optimisation algorithms for design, multi-scale process modelling, automated hardware-independent process planning, online control and distributed NDT for the manufacturing of certified metal parts. Cybersecurity ensures data integrity along the AM workflow, providing a novel manufacturing methodology for the certification of metal AM parts. Click here to visit the project's website.